Louder is better! Immerse yourself in your Xbox One and PS4™ games with the Turtle Beach® Recon 200’s powerful amplified audio with Bass Boost. Louder is better! Immerse yourself in your games with the Recon 200’s powerful amplified audio with Bass Boost. Whether you play on Xbox One or PS4™, the Turtle Beach® Recon 200 gaming headset delivers high-quality game sound and crystal-clear chat through its superior 40mm speakers and high-sensitivity flip-to-mute mic. Additionally, the Recon 200’s lightweight design, metal-reinforced headband, and synthetic leather-wrapped memory foam cushions provide added durability and unmatched comfort. 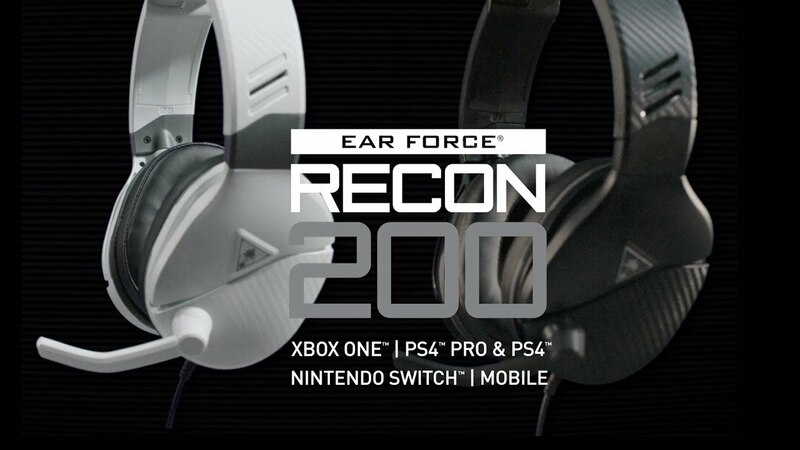 The Recon 200 has a rechargeable battery that delivers over 12-hours of gaming per use, and features onboard controls for Master Volume, Variable Mic Monitoring so you can hear and adjust the volume of your voice inside the headset to avoid shouting at other players, and for selecting between Xbox One and PS4™.